The 1970s spawned the first truly portable analog synthesizer, and while it was quickly adopted by lots of renowned musical artists including Jan Hammer, Chick Corea, Rick Wakeman, Jean-Michel Jarre, Isao Tomita and Keith Emerson to name a few, it was somewhat temperamental and very expensive. 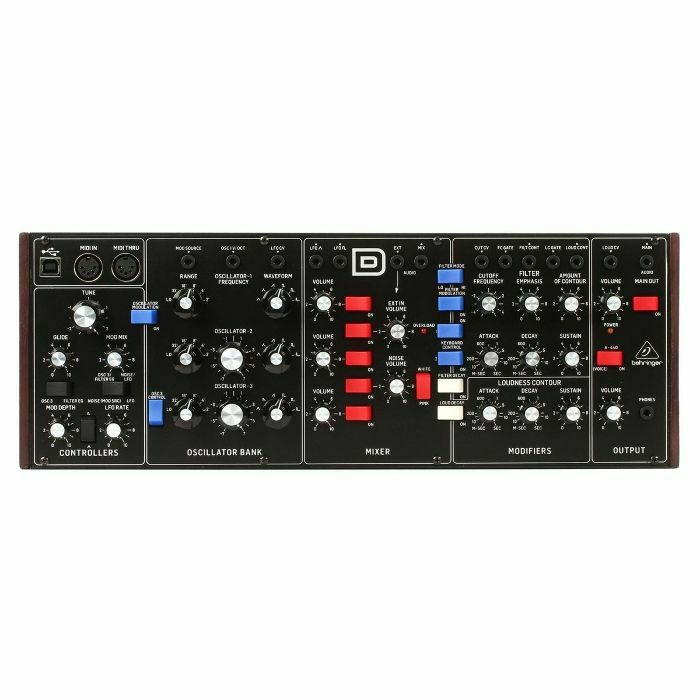 An ultra-affordable homage to that iconic synthesizer, with all the features of the original and then some, the BEHRINGER MODEL D lets you conjure up virtually any monophonic sound imaginable with incredible finesse and ease. The pure analog signal path is based on authentic VCO, VCF, VCA and ladder filter designs in conjunction with a dedicated and fully analog triangle/square wave LFO. And when it comes to protection and convenience, the MODEL D can even be mounted in a standard Eurorack, making it ideal for the studio and/or the road. Owning a MODEL D is like having your own personal time machine, enabling you to freely embrace the past - or shape the future! Great care has been taken in designing the MODEL D including the true to the original "D Type" circuitry with its matched transistors and JFETs, ultra-high precision 0.1% thin film resistors and polyphenylene sulphide capacitors. This highly-focused attention to detail is what gives the MODEL D its ultra-flexible sound shaping capability, which covers everything from super-fat bass and lead tones, stunning effects, progressive organ sounds - and all the way out to the otherworldly sounds of your imagination. The inspired synthesizer tracks laid down in the 1970s and '80s are etched in the annals of progressive rock, wave and synth-pop music forever, making them truly classic in every sense of the word. MODEL D's pure analog signal path with legendary VCO, VCF and VCA circuits, lets you recreate all of that magic - or design incredibly fat and original sounds that will make you a legend in your own right! MODEL D's 3 highly-flexible Voltage Controlled Oscillators (VCOs) provide an incredible range of 5 waveforms for sculpting the perfect sound. Oscillators 1 and 2 options include: triangular; triangular/saw; saw; square; wide pulse; and narrow pulse, while OSC 3 features: triangular; reverse saw; saw; square; wide pulse; and narrow pulse. Additionally, all 3 VCOs can be adjusted across an extremely-wide, 6-octave range (LO, 32', 16', 8', 4', and 2'). This amazing flexibility gives you all the tools you need to be your creative best. The very heart of MODEL D's sound is its highly-flexible 24 dB Ladder Filter, which lets you freely experiment with the Cutoff Frequency, Emphasis, and Contour to dial in the perfect sound. MODEL D's Filter Mode switch can be set to either Lo- or Hi-pass for selecting the range of your choice. You can also adjust the Attack, Decay, and Sustain controls to affect the cutoff frequency with time. The VCA Decay switch lets you set the length of time the note lingers after the key has been released. Additionally, support for filter-keytracking allows you to select how much filtering is applied based on the note being played. And if you want to add modulation, just set the Filter Modulation switch to the On position and use the Controllers Mod Mix knob to make it so. 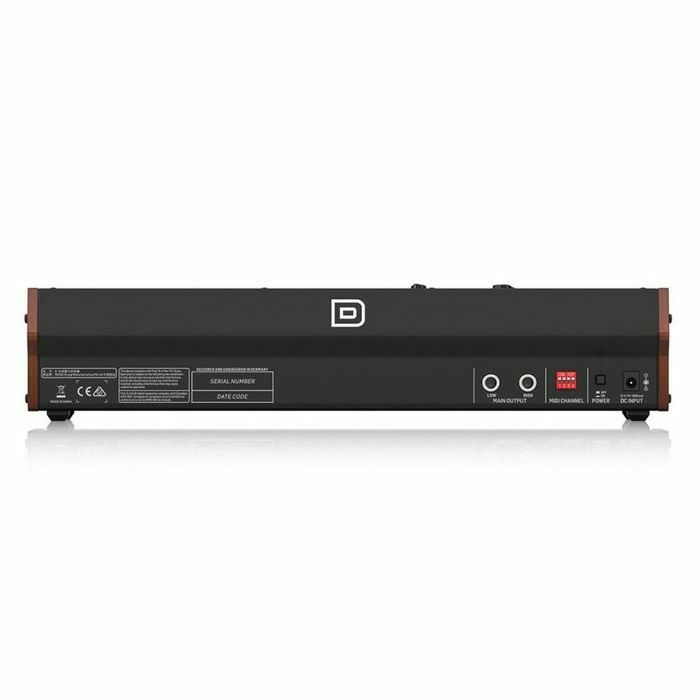 The VCA can even be overloaded via MODEL D's feedback circuit to add insane spice and edge to your sounds - without saying "goodbye" to your precious low-end content. 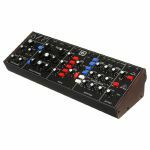 You are always in complete control of MODEL D's onboard modulators, which features: adjustable Tune; Mod Depth; LFO Rate; Glide (portamento); and Mod Mix knobs. A range of switches is provided for selecting between: triangle or square wave oscillation; modulation On or Off; OSC 3 or Filter EG (Filter Envelope); and Noise (Mod SRC) or LFO. The Tune knob is used to adjust the frequency of OSC 1, 2 and 3 (as long as the OSC 3 switch is turned off). The internal Noise generator, which is switchable between either Pink or White noise for dramatically expanded waveform generation, is the default modulation source, unless an external Mod Source is connected at the 3.5 mm input jack. 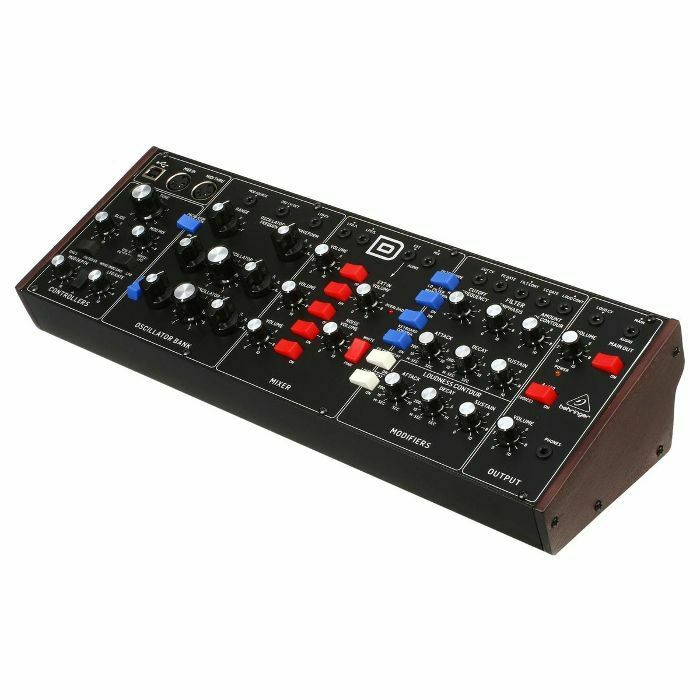 As we stated earlier, the BEHRINGER MODEL D is the ultimate mono, all-analog synthesizer in its class - especially when it comes to sound quality, versatility and affordability.